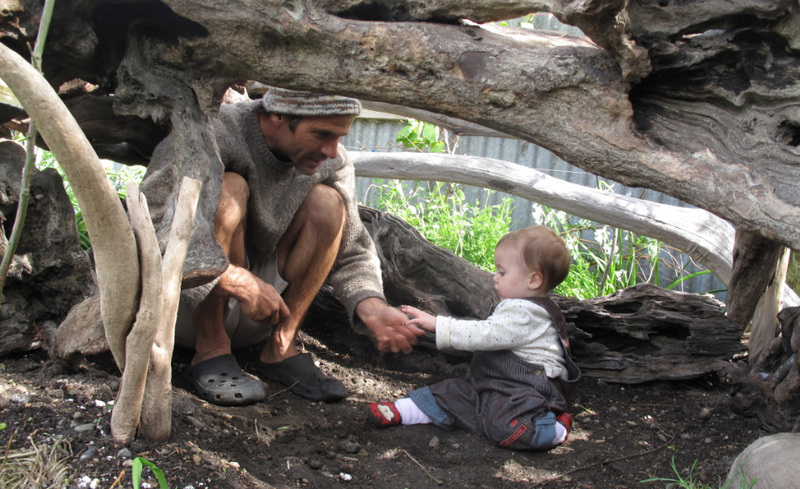 In this guest post, Nelson Lebo from Whanganui in New Zealand, writes about how the birth of his daughter has furthered his resolve to live more lightly on the earth. Spending time talking and encouraging creative, independent play with your baby enhances brain development. Verti off for an adventure in her bicycle trailer. I have observed many friends over the years put their sustainable lifestyles on hold after having a baby. In conversation, they are quick with rationalizations and excuses for: buying a bigger car; using disposable nappies; driving short distances instead of walking; even using anti-bacterial soap. For me, the opposite has happened. When Verti was born in our home in August, 2012, I was motivated to double-down on my commitment to a healthy environment. I see my daughter as an excuse to embrace sustainability, not as an excuse to abandon it. When I strap her into our bicycle trailer for a ride into town on a windy, rainy day, a voice echoes in my head: “What did you do, papa, when the Earth needed help?” Did I take my ethical commitments seriously or did I take the easy way out? Sometimes I project in my mind to a time and place when Verti is telling her friends what her parents did to make the world and their community a better place, and how she helped us do it from as early as she can remember. The day she was born we planted an apricot tree over her placenta. The following week we built a community garden on our front lawn. 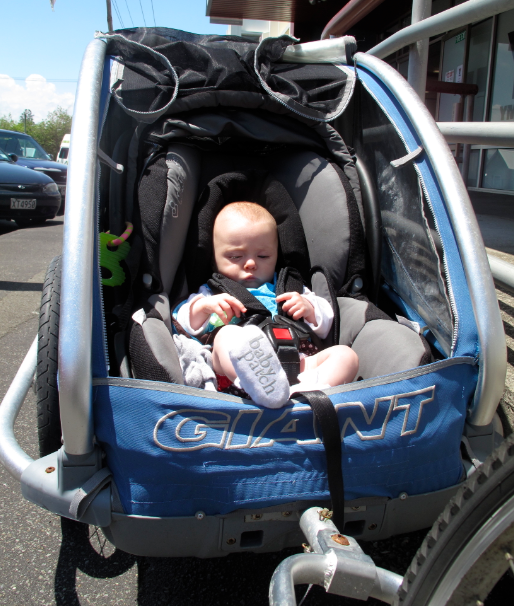 A month later we bought a secondhand bicycle trailer. Daily household routines are often integrated with childcare. Those familiar with the Transition Movement would be aware with the three E’s: Environment, Economy, and Energy. Since 2008 we have seen extreme volatility in all three. As practicing permaculturists, it is our ethical obligation to protect our families and communities from these powerful but largely external forces. Resilience is the term adopted by the Movement, and our family’s interpretation of resilience is known as Eco-Thrifty. This form of voluntary simplicity allows us to maintain a small ecological footprint while saving money and having more time to spend together. 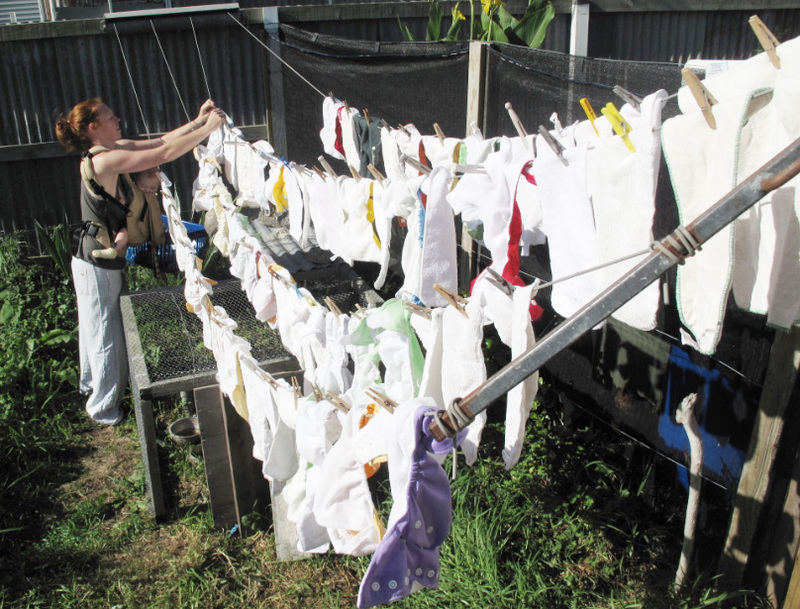 First we had the Eco-Thrifty Wedding, then the Eco-Thrifty Renovation, and now the Eco-Thrifty Baby. It’s no secret that living this way takes time and effort. But if the time is well spent and the effort is focused but relaxed, it can feel more like play than work. Integrating Verti into our routines becomes part of her early childhood education. I remember, in a film based on Helena Norberg-Hodge’s book, Ancient Futures: Learning from Ladakh, how infants and toddlers were traditionally brought out into the barley fields with the family and work proceeded at a sociable pace. On our property it is usually just Verti and me – as mum works a part-time job – but will still take it nice and easy. The best research in brain development emphasizes the importance of parents talking to children and encouraging creative, independent play. Of course there is also no TV before age three, but who has time for TV when there are nappies to wash, gardens to tend, driftwood to collect from the beach, forts to build, and pedal-powered adventures to be had! Verti features on the cover of the 2014 Permaculture Calendar, now available in New Zealand. Hey, it’s Charlie who sings the Permaculture Principle tracks! 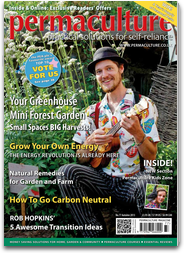 Watch out for an extensive story in Permaculture Magazine about what Nelson, Dani and Verti are up to or visit their website as their continuing adventure unfolds. 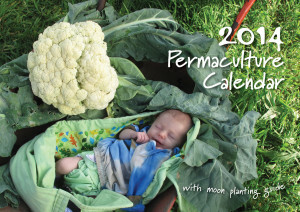 If you live in New Zealand then you may wish to consider purchasing the 2014 Permaculture Calendar, featuring Verti on the cover, directly from Nelson to reduce your ecological footprint. Also available from our partners in the UK and USA.